Russia is famous for producing the AK rifle, an amazing design known for its reliability under adverse conditions. 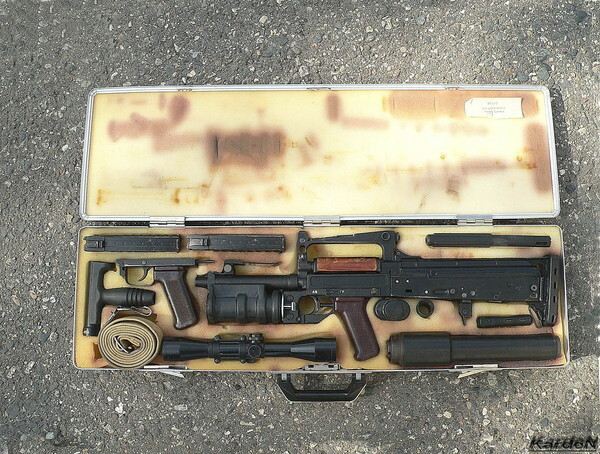 However, Russia has also fielded some rifles with questionable or just plain bad designs and characteristics. Here are some of the worst Russian and Soviet rifle designs to have seen the light of day. While Shpagin is best known for his submachine gun, the PPSh-41, he also entered the 1944 trials to build an automatic weapon for the new intermediate M43 cartridge. While other designs—including Kalashnikov’s successful AK predecessors—used locked breech systems that were driven by gas pistons, Shpagin’s gun  was a simple adaptation of a straight blowback design to the new cartridge. In order to successfully slow the movement of the bolt to allow for firing, the bolt was extremely heavy. In a 5.5kg gun, the bolt weighed 1.2 kg. When the gun was fired, the vibrations were described as extreme. Due to the poor performance of Shpagin’s rifle, no further attempts were made to make blowback guns in intermediate calibers. While Simonov is best known for his SKS carbine, he also adapted  his design  to compete with Kalashnikov’s rifle in trials around 1955. His submission in the AS-10(X)-11-56 designs were an adaptation of his short-stroke gas piston driven tilting bolt design. They were meant to improve upon the Kalashnikov by placing the return spring around the gas piston, allowing the receiver to be more compact. The fire control group was also placed in a single removable unit (similar to the H&K fire control packs, and later the AN-94 fire control group) to make maintenance easier. In retrospect, this was already an anachronistic decision, since the DP machine gun tried placing the return spring near the barrel in trials—only to be moved back behind the bolt on the DPM (DP Modernized) machine gun, due to reliability issues. As expected, Simonov’s weapon was removed from tests due to poor reliability of the operating mechanism. A. F. Baryshev is an oddity in Soviet firearms design. Having no connection to the large design bureaus, he built  and prototyped  a series  of rifles over two decades in standard military calibers. Similar to the Avtomat Shpagina, Baryshev’s weapons operated on a blowback cycle. Baryshev also experimented with locking mechanisms to retard the blowback cycle so that the bolt could be lighter. This method could be considered similar to lever-delayed or roller-delayed mechanisms as used by the French and German militaries. The advantage Baryshev’s design was that the weapon could be more compact around the barrel, and possibly lighter, due to the lack of a gas piston and gas tube. Baryshev also designed his rifles to fire from an open bolt. As a result, his rifles had lower first shot accuracy than the rifles in service and had a higher probability for foreign material to enter the chamber. Due to these drawbacks, the Soviet military rejected Baryshev’s rifles. While the SVT-40 as one of the best semi-automatic rifles of its era, the AVT-40 was one of the worst. In an attempt to supplant the DP-28 light machine gun and provide Soviet infantryman with increased firepower, an automatic firing mode was added to the SVT-40, creating the AVT-40. The addition of this mode created a myriad of problems . The AVT-40’s longer fifteen-round magazines hindered shooting while prone, so they were ditched in favor of the standard ten-round SVT-40 magazine. The reduction in magazine size severely limited the length of time automatic suppressive fire could be used. Continuous fire wrecked the barrels of the AVT-40, as they were lightweight and only meant for semi-automatic fire. The rifle was prone to jamming in sandy or dusty conditions. There were even reports that the stock would crack under the increased stress of fully automatic fire. As a result, most AVTs were only used in semi-automatic mode, negating their original purpose. The Groza  was meant to supplant or replace the Kalashnikov (specifically the AKS-74 or the AKS-74U variants) as a close-quarters combat weapon. It was also intended to be modular, being able to accept a variety of attachments such as a suppressor, grenade launcher and various sighting devices. It shared over 70 percent of its parts with the Kalashnikov—making it easy to manufacture with existing machinery. Therefore, the Groza sounds like an ideal gun for close quarters combat. Real world experience from operators highlighted the problems in the gun’s design. The Kalashnikov action, that has always been described as a little violent, was now located next to the operator’s face , blowing excessive amounts of gas toward the shooter. The short sight radius hindered accuracy and the gun was too rear-heavy when a grenade launcher or suppressor wasn’t mounted. The safety and magazine release  are in the same position relative to the magazine of a traditional AK, meaning that they are very far back on the Groza—instead of moved forwards like on more modern bullpups such as the Tavor X95. This makes changing magazines and turning the safety on and off a difficult affair on the Groza. The worst problem of the Groza is that it’s almostimpossible to fire from the other shoulder  in a close quarters situation, due to the bullpup design and violent nature of the action. Shooting from the opposite shoulder is common technique when shooting around a corner in close quarters combat. The Groza is also difficult to clean, with tons of small nooks and crannies that are hard to reach. There were were numerous logistical problems with the Groza. The rifle was issued in a case with the accessories, but only two magazines , and some units report difficulties acquiring more. This scarcity applied only to Grozas chambered in 9x39mm, as the others use standard AK magazines. The inability to use standard 6L25 magazines, as used in the VSS and AS VAL, could be counted as a strike against the Groza design.